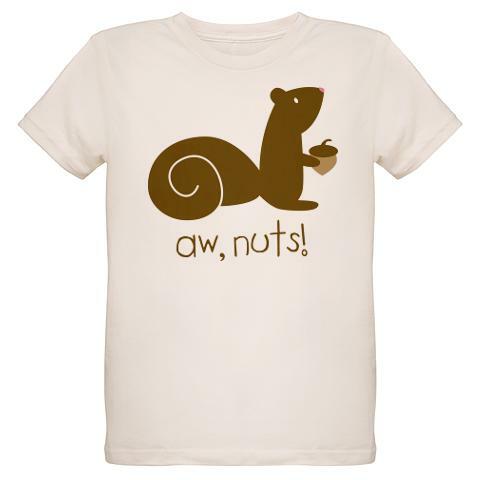 This cute kids' shirt shows a cartoon squirrel holding an acorn. Underneath reads the phrase: "aw, nuts!" This adorable design is available in 11 styles for kids, from bodysuits for infants to shirts for toddlers. You can buy this shirt here. This kids' shirt makes a classic squirrel joke without being inappropriate. At the same time, the simple vector squirrel drawing taps into our collective love for cute baby cuddly things. The hand-written style of lettering adds to the appealing style of this squirrel tee shirt. Although the design doesn't come in adult or youth sizes, I can understand why some people wish it did!